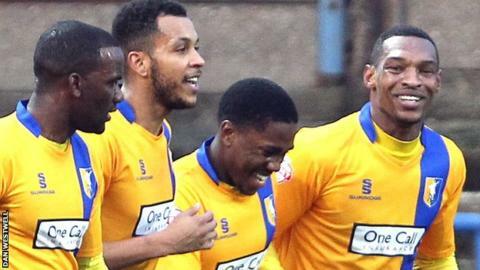 Krystian Pearce's equaliser earned a point for Mansfield Town after they fell behind at home to York City. The visitors went in front when Luke Summerfield's free-kick was met by a deft touch by Dave Winfield. Pearce levelled when he guided his header from 12 yards inside the left post from Adam Chapman's corner. The Stags had glorious chances to win it as Matt Green hit the crossbar from only five yards out and Reggie Lambe also hit the woodwork. Match ends, Mansfield Town 1, York City 1. Second Half ends, Mansfield Town 1, York City 1. Foul by Adi Yussuf (Mansfield Town). Blair Adams (Mansfield Town) wins a free kick in the attacking half. Foul by Daniel Galbraith (York City). Attempt saved. Krystian Pearce (Mansfield Town) header from the centre of the box is saved in the top centre of the goal. Hand ball by Luke Summerfield (York City). Attempt missed. Vadaine Oliver (York City) right footed shot from long range on the left misses to the right. Attempt blocked. Matt Green (Mansfield Town) right footed shot from the centre of the box is blocked. Attempt saved. Adi Yussuf (Mansfield Town) header from the centre of the box is saved in the top centre of the goal. Foul by Nathan Thomas (Mansfield Town). Eddie Nolan (York City) wins a free kick on the left wing. Attempt blocked. Reggie Lambe (Mansfield Town) right footed shot from the centre of the box is blocked. Substitution, Mansfield Town. Adi Yussuf replaces Craig Westcarr. Attempt blocked. Lee Collins (Mansfield Town) right footed shot from outside the box is blocked. Attempt saved. Reggie Lambe (Mansfield Town) left footed shot from outside the box is saved in the top left corner. Attempt missed. Nathan Thomas (Mansfield Town) right footed shot from outside the box is close, but misses to the left. Reggie Lambe (Mansfield Town) hits the bar with a left footed shot from outside the box. Corner, Mansfield Town. Conceded by Eddie Nolan. Blair Adams (Mansfield Town) wins a free kick on the left wing. Attempt missed. Nathan Thomas (Mansfield Town) left footed shot from outside the box is high and wide to the left. Matt Green (Mansfield Town) hits the bar with a right footed shot from very close range. Attempt missed. Bradley Fewster (York City) left footed shot from the left side of the box is high and wide to the right. Foul by Adam Chapman (Mansfield Town). Krystian Pearce (Mansfield Town) wins a free kick on the left wing. Substitution, Mansfield Town. Nathan Thomas replaces Matty Blair. Reggie Lambe (Mansfield Town) is shown the yellow card for a bad foul.